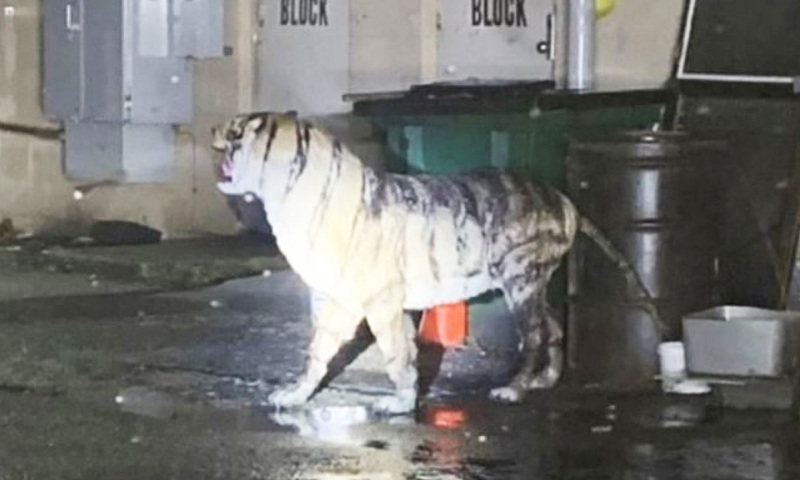 A lifelike tiger statue discarded in an alleyway behind a Virginia shopping center prompted a concerned police officer to do a double take. At first glance, the big cat looked real — standing next to garbage bins with its tail up and fangs showing. But once the officer from the Prince William County Police Department shined his car lights on the mystery figure, he realized it was simply a plastic replica. The cop was quick to snap a picture of the life-size tiger mannequin to spread a warning to local business owners. “Note to business owners, when disposing of realistic, life-size animal statues, please do so with caution. While on proactive patrol in a county shopping center, one of our officers experienced a moment of…uh…shock before realizing this little guy was harmless,” the police department joked online Tuesday, sharing two photos of the fake animal. Nearly 4,000 people liked the pictures on the Prince William County Police Department’s Facebook page as of Wednesday morning. And dozens of locals couldn’t help but comment on the hilarious mixup. “It probably wouldn’t hurt to put it in some places cause it might stop some fool from committing a crime. Just a thought,” one Facebook user suggested. “Now, that’s funny!” another commented. “Boy could you have some fun with that statue. 🤣Oh the possibilities!” a woman exclaimed. Next time, the police department suggests disposing of any realistic mannequins inside a bin or bag rather than putting them out on the street.